“Hi Alex! 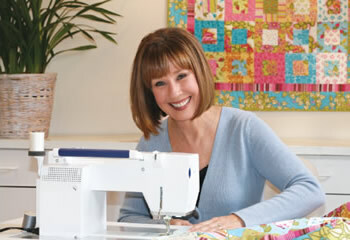 I had to write and tell you I received a Quilters Select rotary cutter and I have just one word...Hallelujah! I have such a problem with the light, flimsy cutters on the market and to have one with some heft to it is a godsend. Thank you so much for bringing this product to the market! “Have you ever stumbled across a product that totally exceeded your expectations? It is one of the best experiences in life. The only thing that can make it better is if you are desperately searching for a solution when you find this product by accident. Such was the case for me. A product I have used for years went through some changes and I found myself searching for a replacement when a friend asked if I had ever tried Floriani Products. I had not, but I immediately began looking for them. I contacted several Quilt Shops before finding one that carried the Floriani Products, but once I tried it I fell in love. I couldn’t believe these products had existed for years and I didn’t know about them. Not only did I not know about them, but the Quilting World I live in, except for a very small group, did not know about them and I made it my mission to change that! I phoned the office of RNK Distributing looking for the creator of the Floriani Product Line, and was referred to Kay Brooks.When Kay got the message she called and we scheduled a meeting to discuss these amazing products I had never been aware of. I explained to Kay how much I loved using the products but I was perplexed that very few people in the Quilting World knew about them or had access to them through their local Quilt Shops. I wanted to change that for the good of the industry. Within a matter of minutes Ricky (not my Ricky Tims), but Kay’s husband (and by now you know Ricky and Kay are the RNK Founders) asked a question that will no doubt have a major impact on the Quilting Industry. He asked me if I would like to work with Kay to build a line of quilting Products per my specifications using the adhesives and fusibles Kay had created for Floriani that would be distributed exclusively through Independent (no chains or mass) Retailers? If you are an Independent Quilt Shop Owner, or Retailer this line was created for You too! For too long you have been forced to carry products that were created for your strongest competition, the Chains and Mass Merchants. Quilters Select™ is not and will not be sold through those retailers. This is not only a line consisting of the highest quality products available anywhere in the world, it will be marketed in a manner that will guarantee its retailer maximum profit margin.